Welcome to the AcuKanpo home page! Respiratory system: Sinusitis, Bronchial problems, Colds, etc. Cardiovascular system: Palpitations, High Blood Pressure (HBP), circulatory problems. Digestive System: Dyspepsia, nausea, food absorption problems, Thrush, leaky gut, irritable bowel and inflammatory bowel conditions. Nervous system: Disturbed sleep, stress, headaches, difficulty with relaxation. Immune System: Chronic infections, hay fever, Candida etc. Skin Acne, eczema, fungal infections. Muscular and skeletal system: back pain, rheumatic and joint pain, cramps, sprains, etc. Gynaecological: PMT/PMS, problems with fertility, pre-and post-natal care, etc. Urinary problems: Cystitis, Urethritis, prostrate problems, etc. The initial assessment and treatment lasting one hour typically costs £60.00. Subsequent treatments are £50.00 per treatment. Should special circumstances of chronic ill health be present requiring more than one treatment per week, a package is on offer. It typically comprises eight treatments in the period of one month and can be agreed to a budget. Please do not hesitate to enquire as prices do tend to be subject to these and other variations. China, Japan, Korea, Vietnam; Jesuits who translated the classic texts for Europe introduced the technique in France 350 years ago. Two thousand years of recorded history (Nei Jing, Classic of the yellow emperor). Extremely versatile and flexible system of healing. When applied professionally it is a very safe method with no adverse side effects. (1) Disposable needles cut by a laser and sterilized to clinical standards are exclusively used throughout. It benefits all functions (3) throughout the body extending from regular metabolic activity to fertility problems. On Earth we are part of and exposed to an ocean of electromagnetic energy from numerous sources natural and manmade. (1) Standing waves of an extremely low frequency (ELF) present in our environment as well as inside our tissues are thought to exert an important effect on the health of our body tissues. (2) Acupuncture therapy is thought to tap into and to stimulate these fields inside our body so as to effect a positive healing response. A variety of techniques are sometimes combined to enhance the therapeutic effects of acupuncture. According to individual needs the treatment can include the use of acupressure or cupping techniques as well as hot needle moxibustion (burning of herbs at the end of a needle). Energetic stimulation of points with magnets or tiny electrical charges passed through the needles is also used to further enhance the therapeutic effects. The ears, for example, are a specific region of densely packed acupuncture points (more than 100). Ear acupuncture has proved very effective when a prolonged stimulus is required in ongoing problems or to support people who wish to stop smoking for example. A famous sage said that it is too late to dig a well when feeling thirsty. Likewise, a multitude of today's symptoms remain unnoticed according to conventional standards. Acupuncture offers a specific range of therapeutic support as it is able to detect a problem at an early stage, often long before it can develop its own damaging momentum. The profile of an energy imbalance is usually clearly revealed by feeling the pulse and using other traditional diagnostic methods during the individual assessment. It is for these reasons that acupuncture has often been called a system of preventive healthcare. (1) Acupuncture, the energy medicine of the Far East, is well adapted to our western life style. (2) Stimulation of discrete points (Acupoints) along specific lines in the body called Meridians have demonstrated the power to re-integrate and balance specific processes in our body. Polluting factors such as exhaust fumes, electro-smog and other stressful effects of modern life may all impose a chemical burden on our bodies. As the chemical stresses built up they are liable to gradually affect our body and mind. A gradual weakening of immune responses can thus result in more deeply entrenched systematic problems that are then labelled by various medical names according to the nature of the tissue or system they manifest in. (3)Modern research has focused an a variety of positive healing effects through acupuncture on the body mind continuum. Dr. Kyoko Okura of Keio University Hospital in Tokyo has recently successfully patented a diagnostic system to monitor imbalances and treatment progress on the basis of meridian activity on numerous clinical conditions as diverse as cardiovascular, digestive, hepatic and gynaecological problems to name a few. Professors Zhang and Popp are currently investigating the energetic state of acupuncture points (coherency and incoherency of waves passing through tissues of the human body) and its impact on states of health and disease, at the University of Kaiserslautern, Germany. 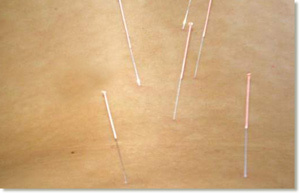 Extremely fine (1)needles are painlessly inserted into the acupoints to activate the body's own individual healing response. This acts as a powerful stimulus to reactivate exhausted, weak and excessively tense tissue by improving the circulation of blood and energy, also known as Qi(2). When in harmony blood and Qi always travel together which leads to an increase in vitality and general well being. The traditional Chinese view (3) puts great importance on the maintenance of the strength of the digestive and defensive systems as both are concerned with outside factors that are constantly influencing our health. In contemporary understanding this often refers to different activities within the immune system and the absorption of nutrients in the digestive system. Great emphasis has always been placed on the strength of the Qi within the reproductive system which amongst others concerns the rhythms and healthy state of egg and sperm (fertility), a balanced menstrual cycle and the state of the adrenal glands. All of these aspects come under the domain of the Kidney meridian for example. All tissues require electrical input to work properly. The German atmospheric physicist, W.O. Schumann suggested, that the space between the surface of the earth and the ionosphere acts as a resonance cavity like a chamber in a musical instrument. These Schumann resonances or standing waves (ELF) act in the form of micropulsations triggered off by lightning anywhere on earth, that can affect the health of each individual. The action is based on electromagnetic fields with a tiny charge that are thought to entrain the bodies' own regulatory systems within the nervous system of the brain. Surprisingly enough we do not need to be directly exposed to strong weather fronts or thunder and lightning to experience these subtle phenomenae. Numerous studies have found that acupuncture stimuli can have similarly entraining effects on our regulatory system. This in turn triggers a healing response within the body (i.e the coherency of field resonances in the tissues is re-established; research by Zhang and Popp). Clinical studies in Japan definitively proved that an increase in the strength of signal transduction and corresponding healing effect were noted when Acupuncture needles came to be used therapeutically. Particularly the various connective tissues of the body resonate with these pulsations. It is a largely overlooked and ignored fact that this tissue actively influences every single living cell throughout the body. Nerve endings that relate information of cold or heat, pressure, pain or pleasure terminate here. Immune cells are waiting to spring into action on sight of any intruding impurities. Capillaries made of tiny muscle fibres discharge their blood towards the living cell and thus represent the main supply line for nutrients to the living cell. Tissue regeneration is triggered when an injury has caused a bruise or cut. It comes as no surprise that very definite healing effects were noted when using acupuncture. (2) Hard wiring versus subtle effects: "nature and nurture"
As acupuncture utilises the more gentle effects of an analogue signal transduction throughout the body its effects are by definition not the same than the action of orthodox drugs that influence the chemical 'all or nothing effects' at cellular receptor sites. It rather extends a powerful pulse throughout the system that supports the living cells in their working. As the connective tissue extends its fibres into the living cell, known as a cytoskeleton, the stimulus given by acupuncture can sent its resonant healing stimuli right inside the cell and its nucleus. Based on this strong oscillating analogue signal that works via the connective tissues all of the body is sensibly stimulated in a safe and reliable way without unwanted side effects. With this support acupuncture works in perfect harmony with any modern system of medicine which I personally witness in my work at the Yokohama clinic of Endovascular therapy. There a whole array of cases from Rheumatoid Arthritis, Endometriosis right through to cancer are treated with a combination of biomedical and complementary techniques. Re-establishing harmony in a truly complementary fashion has demonstrated that it improves sleep patterns, reduces levels of irritability and stress, revitalising a general sense of well-being. This naturally leads to increased energy levels, well-being and a more positive outlook on life. Alongside with these non-specific effects an improvement of physical symptoms are often noted as is repeatedly demonstrated in my daily work. Joska Ramelow - BSc.Hons MBAcC MRCHM Dipl. Soc.